Photo: Joel Jessup Farm, ca. 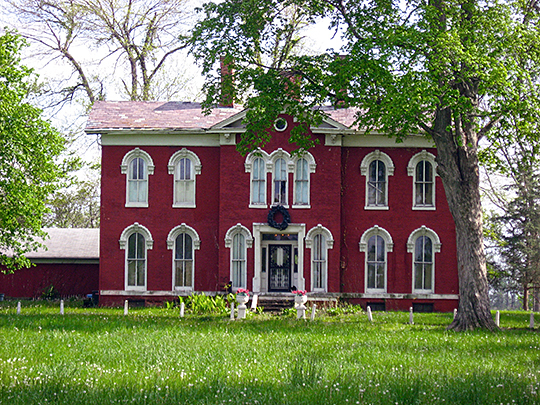 1864, County Road 800-S, Guilford Township, IN. Listed on the National Register of Historic Places in 1998. Photographed by User:Nyttend (own work), 2011, [cc0-by-1.0 (creativecommons.org/publicdomain/zero/1.0/deed.en], via Wikimedia Commons, accessed April, 2013. The Hendricks County Government Center is located at 355 South Washington Street, Danville, IN 46122; phone: 317-718-6056. Hendricks County was officially formed in 1824 and named for Indiana's current governor at the time, William Hendricks. Later the same year Danville was chosen as the county seat because of its close proximity to the geographic center of the county. At the time, many families settled in Guilford Township, named for Guilford County, North Carolina where many of the settlers originated. From the time of the county's creation until 1868, several township and county lines were shifted and new townships were formed. The Cumberland Road (also known as the National Road) came through the county in 1830, opening up the southern part of Hendricks County for settlement and development. In 1839 the town of Plainfield was formed along the National Road. Hendricks County had a large number of Quaker settlers in the early 1800s, and Plainfield (formed by the Quakers) quickly became a large Quaker center. In the 1840s Irish Immigrants were hired to drain the swampy northeastern land of the county, which soon became excellent farmland. The Indianapolis and Terre Haute Railroad (also known as the Vandalia Line) connected Indianapolis to Plainfield in the 1880s. Soon after, several more interurban lines were created; causing an increase in the trading and shipping of livestock all over the Midwest and the completion of the Indianapolis and St. Louis Railroad furthered economic growth. Up until 1880 many immigrants to Hendricks County came from Indianapolis because of the good farmland and opportunities available in Hendricks County. After 1880 the trend changed in favor of people leaving Hendricks County to pursue jobs in Indianapolis made easier when in 1906, the Interurban (an electric railroad) opened. In 1930 the line was discontinued due to money problems and the rise of the automobile. Over time, Hendricks County has changed from a rural, agricultural based community to an increasingly suburban community. As Indianapolis expanded following World War II, suburban housing tracts began to appear throughout the eastern portion of the county. County of Hendricks, Indiana, Hendricks County Comprehensive Plan, 2006, prepared by RATIO Architects Inc., Strategic Development Group, Inc. and The Planning Workshop, www.co.hendricks.in.us, accessed April, 2013.